Pupils learn the characteristics of regular polygons while they are studying geometry. In this game they can practise matching the shapes and their angles to the descriptions on the Game Board while playing Connect Four.Learning Outcomes: Pupils will be able to recall the characteristics of regular polygons. The ability to identify and label shapes is fundamental in mathematics, and useful in many other subject areas. 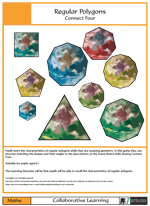 In this activity students can practise labelling and identifying various geometric shapes.Learning Outcomes: Students will be able to name and identify different geometric shapes. There are some words in the English language that have letters that are written but not pronounced - so called ‘silent letters’. Words containing silent letters are difficult to learn to spell, even for older children. This is why we have devised this activity to reinforce the learning of these awkward words, in a fun and interactive way. Learning Outcomes: Children will have practised and improved their spelling of words which contain silent letters. 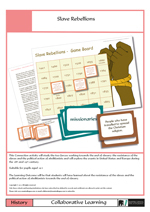 This Connection activity will study the two forces working towards the end of slavery: the resistance of the slaves and the political action of abolitionists and will explore the events in United States and Europe during the 18th and 19th century.Learning Outcomes: Students will have learned about the resistance of the slaves and the political action of abolitionists towards the end of slavery. 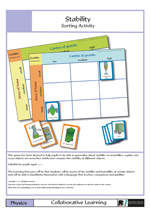 This game has been devised to help pupils to be able to generalise about stability (or instability), explain why some objects are more/less stable and compare the stability of different objects.Learning Outcomes: students will be aware of the stability and instability of certain objects and will be able to familiarise themselves with a language that involves comparison and qualifier. Suffixes can be difficult to join onto words and spell, so we devised this game to give students a fun way to practise adding suffixes. 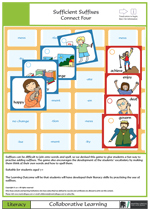 The game also encourages the development of the students’ vocabulary by making them think of their own words and how to spell them. Learning Outcomes: The Learning Outcome will be that students will have developed their literacy skills by practising the use of suffixes. 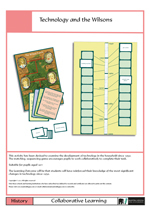 This activity has been devised to examine the development of technology in the household since 1950. 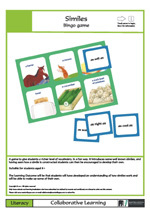 The matching, sequencing game encourages pupils to work collaboratively to complete their task. Learning Outcomes: Students will have reinforced their knowledge of the most significantchanges in technology since 1950. 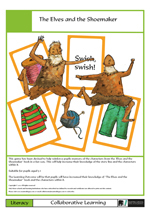 This game has been devised to help reinforce pupils memory of the characters from the ‘Elves and the Shoemaker’ book in a fun way. This will help increase their knowledge of the story line and the characters within it.Learning Outcomes: Pupils will have increased their knowledge of “The Elves and theShoemaker” book and the characters within it. 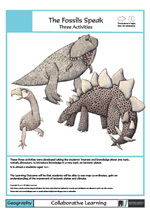 This activity was developed taking the students’ interest and knowledge about one topic, namely dinosaurs, to introduce knowledge in a new topic on tectonic plates. 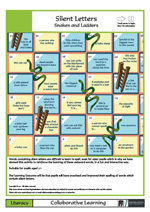 Learning Outcomes: Students will be able to use map co-ordinates, gain an understanding of the movement of tectonic plates and climate.If you are a subscriber of the Collaborative Learning library (£110 membership with a FREE PENpal with labels and software) then you can download the pdf free of charge and print out. But frankly it is cheaper to buy the pack: all prints are made on cards, cards are sound enabled for PENpal adding an extra dimension of narration, in English and other languages, to the activity. All pictures are illustrated by artists. Game boards are laminated, Playing cards are perforated to give a square edge.The whole package not only looks highly professional, but will last much longer. Every component are stored in an accompanying sealable plastic bag.Each activity can be in other languages using shared audio files for PENpal. So, a Polish teacher or Polish speaking Buddy or a Polish EAL co-ordinator can translate key words and rules in Polish and upload their version for others to share with the FREE ShareLINK software that comes with PENpal. If you have bought the activity then you can also play in in Polish or any other language. Click here to find out more about ShareLINK.